It’s time to look at a film based on a true story. This one is about The Greatest Game Ever Played, at least in Golf. If we’re talking ever, then it’s probably one of the 1990s Dallas Cowboys Championship games. I can see why this game is well known though as it was one of the first times an amateur was able to take on a professional in a game that went into overtime. It was definitely a very impressive showing. The film is also pretty good about not adding in too much drama and stuff once the Golf starts. It does seem to add in a bit of padding to the first half though which is the part that doesn’t work too well. Basically Francis has always wanted to be a golfer. Unfortunately his father doesn’t like this option as it’s extremely risky and Francis may not make any money. He would then have a later start on life and that could ruin everything. Francis is okay with putting it all on the line though and after losing his first few golf games he gets ready for the US Open. It’s time to win the biggest tournament of his life, but is Francis really ready for such a feat? He will have to defeat the reigning champ from Europe as well as his counterpart from the U.S., and every other Golf player worth their salt. It won’t be easy, but Francis knows that ultimately you just have to play your own game of Golf and the rest will just sink in. The golf visuals are pretty nice. The film does its best to make the actual golf look really exciting with how fast the balls move and everyone’s reactions the whole time. There are a bunch of cutaways and dramatic camera angles to sink it in. Some top players are able to erase the surroundings as if they held the Infinity Gauntlet and this lets them really focus. The ball makes uncanny turns to dodge obstacles and even picks up speed when it should have stopped. It may not be the most realistic game of golf out there, but it certainly makes the game more appealing. The film didn’t always make Francis look great though. He did give his father his word that if he lost he wouldn’t pursue the game anymore and ultimately breaks that promise. He shouldn’t have agreed to such a thing in the first place even if he was under duress at the time. He was a kid at the time so I suppose I can’t be too hard on him. He does get distracted and knocked off of his game rather easily though. His partner has to constantly remind him to tune everyone out, but Francis still loses many shots as a direct result of this. As I mentioned earlier, the first half of the film before the tournament doesn’t hold up quite as well. They try to give the older Europe champion a bit of a backstory. It’s never properly delved into, but you can get the gist of it from the images. It just feels a little forced into the story since it ultimately isn’t too relevant. Francis’ drama at the beginning also isn’t quite as interesting as the actual golf. I don’t know how much of this all happened in the real life accounts, but I suppose if it was all there then of course they would have to add it in. I can’t say much about the ending since it’s all based on true events, but either way I thought it was handled pretty well. All in all there really wasn’t anything bad to say about the movie. At most you might not be thrilled to see just how bad and snobbish the people of England look the whole time. No one from the nobility looks even slightly good and they all just don’t seem to like the people from Jersey. It makes it very easy to root for the Americans. The American top player is a really loud guy who has a chip on his shoulder so he constantly yells at everybody. You still want to root for him over the others since at least he’s fighting for everyone. The others just want the rich to win so they can rub it in everyone’s face. 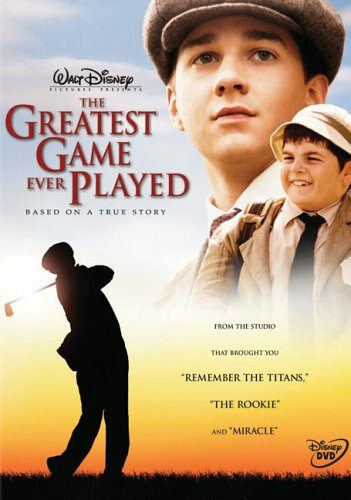 Overall, The Greatest Game Ever Played is definitely a classy film. The golf games are also the best that I’ve seen as I haven’t watched any other Golf movie at the moment. The writing is pretty solid and even the romance was handled rather well as it doesn’t eat up a ton of screen time or accelerate past realism. The characters just talked a bit and then left to their separate ways never to see each other again. It was a happy ending for all of the characters and aside from the rich nobility who were humiliated, the top players were just happy to have had a good game. At the end of the day that’s what you want. If you’re interested in this story then I definitely recommend checking it out. It’ll help you appreciate why we all take Golf so seriously.